Rachel Von | The Journal Gazette The new P.F. Chang's at Glenbrook Square opened Monday. Rob Ertel was getting high-fives, handshakes and words of thanks as people passed him at Glenbrook Square. The market partner for P.F. 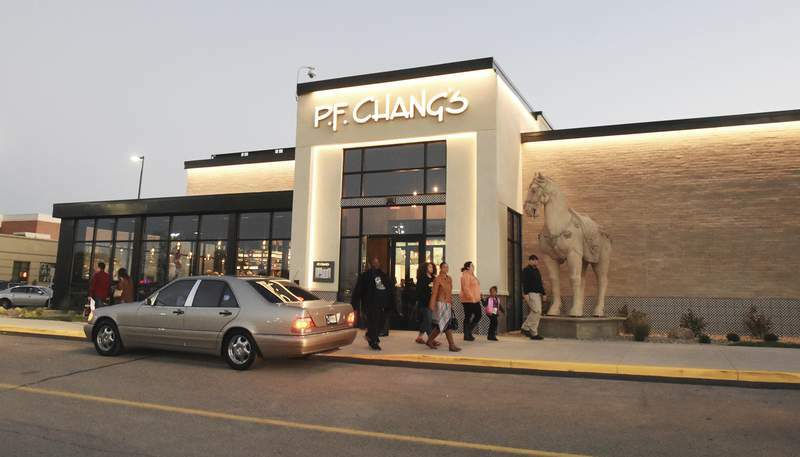 Chang's knew that people in Fort Wayne had wanted the upscale Asian restaurant to come to the city. Overseeing two restaurants in Indianapolis, he had met people who drove two hours just to celebrate birthdays, anniversaries or, really, just enjoy a meal. Still, it was a bit overwhelming to see the city's response to the news that a location would move into Glenbrook Square. The restaurant, the third for Indiana, officially opened to the public Monday. Outside the mall, the brand's signature horse stands tall. Inside, the former Abercrombie & Fitch has been transformed into a modern space with an open kitchen and bar. A hand-painted mural on brick pays homage to Fort Wayne, featuring vibrant colors and apples. The phrase “In Every Appleseed Is an Orchard” is included. The design of the restaurant is part of the new look for the 25-year-old brand that began in Scottsdale, Arizona. The menu features traditional favorites such as chicken lettuce wraps and dumplings but modern Asian favorites, including sushi, pad thai and tempura calamri and vegetables. As a brand, P.F. Chang's is branching out – not only expanding its menu but its reach, opening locations in smaller markets. There are more than 215 locations, with six new this year and eight to 10 more planned for 2019. Bourbon Street Hideaway is celebrating its 10th anniversary with a special piece of wall art that honors the history of New Orleans, as well as Thursday night specials. The restaurant, which opened in 2008 with the goal of offering fine-dining Cajun cuisine, is below Columbia Street at the heart of the city's Landing project. “Bourbon Street Parade” was created by Faisal Martin Meerzo, an artist who splits his time between Wolcottville and Palm Harbor, Florida. The piece was created from two trombones, two trumpets and a clarinet – paying homage to the musical tradition of New Orleans. If the instruments were missing pieces, Meerzo fabricated them and then assembled the art piece with stainless steel screws and epoxy. “For those who have not been to the Big Easy, I wanted to give them a dream to aspire to,” the artist says. The Thursday night specials, which cost $10, include tasso, artichoke and chicken pasta; jambalaya; and French Quarter Buffalo shrimp. There are also $7 martinis, including Key lime, lemondrop, espresso and Berry White. Bourbon Street Hideaway is open 5 to 10 p.m. Thursday, 5 to 11 p.m. Friday and 5 to 10 p.m. Saturday. YoYo's Frozen Yogurt Shop on Lima Road has closed after seven years. A second location on Illinois Road closed in 2015. A refund of the remaining balance of gift cards is available through the end of the year. The Facebook post directs gift card holders to go to B. Antonio's Pizza, next door to the Lima Road shop. Employees will be able to look up the balance and provide a refund. There's less than a month to go before Josh and Emma Metcalf officially open the doors to Auburn Brewing Co., 309 N. Main St. in Auburn. On Nov. 17, along with the DeKalb Chamber Partnership, the couple will host a ribbon cutting at 9:30 a.m.
And after that, the celebration will begin. Auburn Brewing Co., or ABC, will have Head2Hock on-site, and the food truck will serve a full menu from 11 a.m. to 2 p.m. and 5 to 8 p.m. Snacks will also be available. Jordan Allen & the Bellwethers will provide music from 7 to 11 p.m. Located in an early 1900s service station, the Metcalfs want ABC to be a local brewpub that brings the community together by providing a comfortable environment, offering traditional and modern beer styles, all while sharing knowledge of beer design. The brewery will also offer a Beer4Good program. With every purchase of a pint, growler or flight, guests will be able to choose from three local organizations to which a 25-cent donation will be made. Bourbon might very well be the “it” liquor, and LongHorn Steakhouse is playing off the popularity with a new partnership. The national brand has partnered with Knob Creek to create LongHorn Single Barrel Bourbon. The bourbon has been hand-selected and bottled just for LongHorn, and it will be available in all restaurants nationwide. LongHorn has a selection of bourbon, but this is the first curated just for the restaurant. Guests can order it straight, in their favorite bourbon cocktail or in the signature LongHorn Old Fashioned. “When are you going to write about which restaurants are open on Christmas Eve?” a reader asked me over the weekend. I was on my way to lunch with the family when I fielded the question – my mind on what my kids would actually eat that afternoon, not on the holidays. But the truth is that the holidays are not that far away. I've seen signs for holiday catering as I shuttle kids to school, and I have gotten emails about reserving my Thanksgiving turkey. Restaurant owners and managers who would like to see holiday hours printed in this column should send menus and related information to kdupps@jg.net. Deadline for Thanksgiving listings is Nov. 1 and Dec. 1 for the winter holidays. • Don Hall's Original Drive-In on Bluffton Road has reopened after being closed for about five months. The restaurant underwent interior and exterior renovations. • After launching a food truck this year, Smokehaus is nearing its restaurant opening. The barbecue joint will be at 717 Broadway St., New Haven. • George's International Market has moved its panderia so that the original Salsa Grille can grow. The baked goods are now available inside the Broadway grocery, and the panderia space is being remodeled for the restaurant. • Kaysan's, 7102 S. Anthony Blvd., has closed.